As portrayed on the left axis, median income has hovered around $33,000 since 1988. 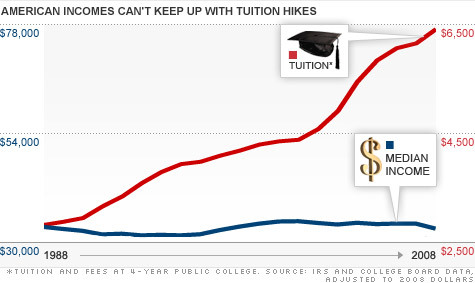 Meanwhile, college tuition and fees -- portrayed on the right axis -- have more than doubled. On the flip side of this problem, some families are trying to limit their student debt by opting for two-year degrees. According to the Department of Education, the portion of middle-income students that enrolled in four-year colleges has dropped, while their enrollment in 2-year colleges has risen, over the last decade. Many of these students, who would otherwise qualify for four-year college, are getting fewer job skills at a time when employers are demanding just the opposite. Economists speculate that one reason unemployment is so high is because the American workforce lacks the skills needed to fill the jobs that are open. As a result, companies may shift these jobs overseas, where wages are often cheaper. Seeing a portion of the middle class shift to two-year degrees certainly doesn't help the United States compete in the global economy. And shrinking opportunities for the middle class don't help matters on the home front, either. "We're seeing further differentiation in incomes, with the rich get richer and the poor getting poorer," Kantrowitz said. "Meanwhile, the middle class often claims they're too wealthy to get student aid, yet too poor to afford college." Are you still struggling to pay off student loans from years ago? In the end, was your college degree worth the debt? Send your story and contact information to RealStories@turner.comand you could be featured in an upcoming article on CNNMoney.